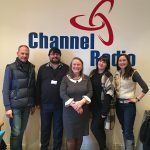 The Community Show is for the Kent community what Business Bunker on Channel Radio is for Kent businesses. Each week the Community Show team promote as many events as possible which are taking place, give shout outs to charities and organisations and finding out more about one particular charity or organisation by having a studio guest each week. Thrown in is music, laughter and chit-chat to make the perfect blend of information and entertainment. Kent and the borders are full of people giving up their free time to help others and there are many charities fundraising for the good of the community. We will be meeting them, finding out about them, and maybe give the listeners inspiration to start something new in their own area. If you would like to tell us about your charity or organisation, we would love to hear from you! If you have any fundraising events or other community events taking place then you must let us know so we can help promote it for you.